The play "Kishi no Himematsu Tsukuwa Kagami" was originally written for the puppet theater (Bunraku) and staged for the first time in the 4th lunar month of 1762 in Ôsaka at the Toyotakeza. 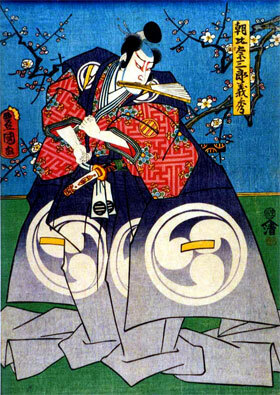 The story was about the rivalry between the Hôjô clan and the Minamoto clan and the central figure was Asaina Saburô Yoshihide. It was not adapted for Kabuki for almost 98 years! It was revived in the 1st lunar month of 1860, in Edo at the Moritaza, where it was integrated within the new year drama "Momo Chidori Nigiwai Soga" [casting]. 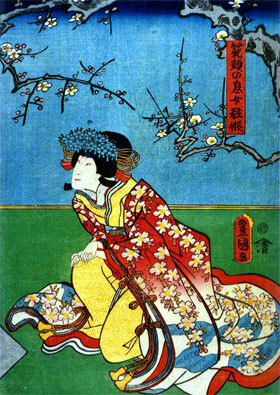 It was performed in Kabuki under the original title in the 5th lunar month of 1861 in Ôsaka at the Goryô no Shibai (miyaji shibai). Nowadays, this drama is rarely staged. The "Asaina Jôshi" act was staged only once during the second half of the 20th century, in June 1958 at the Tôyoko Hall [more details]. Kishi no Himematsu are in fact the seashore pines on the Sumiyoshi Coast near Ôsaka. Tsukuwa means horse's bit. In a different act, one samurai goes into the service of the Minamoto clan wearing the "horse's bit" mon (in the Kabuki world, this is the mon used by Ôtani Tomoemon). "Kishi no Himematsu Tsukuwa Kagami" could be entitled "Mirror of the Pine Trees on the River Bank and the Horse's Bit Crest" in English. The original act was in 5 acts. The only act which has survived is the 3rd one, "Iihara Hyôe Yakata" ("at Iihara Hyôe's Mansion"), which is also commonly called "Asaina Jôshi" ("Asaina the Messenger"). It was a mix of two existing scenes, the famous "Benkei Jôshi" scene ("Benkei the Messenger") from the 1737 drama "Gosho Zakura Horikawa no Youchi" and the no more existing "Funaoka Yakata" scene ("at the Funaoka Mansion") from the 1762 now-forgotten drama "Hana Keizu Miyako Kagami". Visiting Iihara Hyôe Suekage's mansion as a Shogunate messenger (jôshi), Asaina Saburô Yoshihide demands that Hyôe behead Princess Yosooi, a girl in Hyôe's custody who has fallen in an illicit love with Hyôe's son Iihara Hayatonosuke. In reality, this love story is a strategy by Hyôe to protect Princess Yosooi who was ordered by Hôjô Tokimasa to get married with the Emperor's son but fell in love with Minamoto Yoritomo's son Yoriie. While Asaina is waiting in an inner room for the execution of the Shogunate order by Hyôe, two pilgrims, the old man Yomosaku and the young girl Osoyo, come to the front of the mansion to ask for permission to take rest in the house for a while. Fujimaki, Hyôe's wife, calls them in and starts talking with them. Remembering that she had a daughter of about the same age as Osoyo, Fujimaki tells the visitors that she sent her daughter on a pilgrimage at the age of two with her nurse who acted as her guardian and that they have never been heard of for 17 years. Yomosaku thereupon says that her missing daughter is Osoyo and shows her as evidence Osoyo's outer garment part of which is made of the very garment her daughter wore when she left. Yomosaku also says that her nurse died in an accident on board a boar near Chikubushima and he, as a fellow passenger, took over the infant and has brought her up without knowing her identity. Hyôe overhears their conversation and decides to use his daughter as a substitute for Princess Yosooi. Before dying Osoyo tells everybody that she promised to be the wife of a man whom she met on Chikubushima. The man is none other than Asaina, who promises to all the witnesses that he will never marry anybody. Hyôe kills her own daughter in cold blood and offers her severed head to Asaina. At Hyôe's request, Yomosaku takes Princess Yosooi on his pilgrimage, disguising her as Osoyo.